Today, guest blogger Wendy Hill, author of Creative Quilt Challenges with co-author Pat Pease, kicks off her blog tour with a post on the wonders of collaboration and challenging yourself in your creative process. Over the years, we have participated in many challenges. Challenge themes can inspire unusual ideas and send the maker in new directions, but we discovered that challenge themes actually pushed us to explore our own personal design process and understanding of color and design in a more conscious way. There is something liberating about taking on a challenge theme. Each time the quilt-in-progress changed hands, we were free to do anything to it. We genuinely were discovering the “quilt inside us” each time it came back. For Silent Reflection, Wendy kept putting the pieces back together, while Pat kept cutting them apart. With Square Dance, both of us kept playing with the idea of squares using raw-edge collage and thread texturing. Without talking, we were still on the same wavelength. We trace our shared inclinations to 1951, the year we were born. We both grew up in college towns during the transition from the 1950s to the 1960s. Even though we lived more than a thousand miles apart and didn’t meet until around 2006, as friends we have the same similarities and differences sisters might. While we have a lot in common, the way we process information and approach the design process is quite different. We are attracted to the same fabrics, but Wendy is very analytical and organized, while Pat is the opposite–she starts with an idea, but once things go up on the design wall, there is a lot of experimenting with actual materials. Everything Wendy does in her head, Pat does on the design wall. The thing is, we end up in nearly the same place. Our “aha” moment came when we installed our exhibit at PIQF in 2013, and the quilts hung side by side for the first time. These quilts formed a cohesive exhibit without any planning on our part. It’s this push and pull and give and take that makes it fun for us to share our love of fabric as we develop our individual ideas into finished quilts. 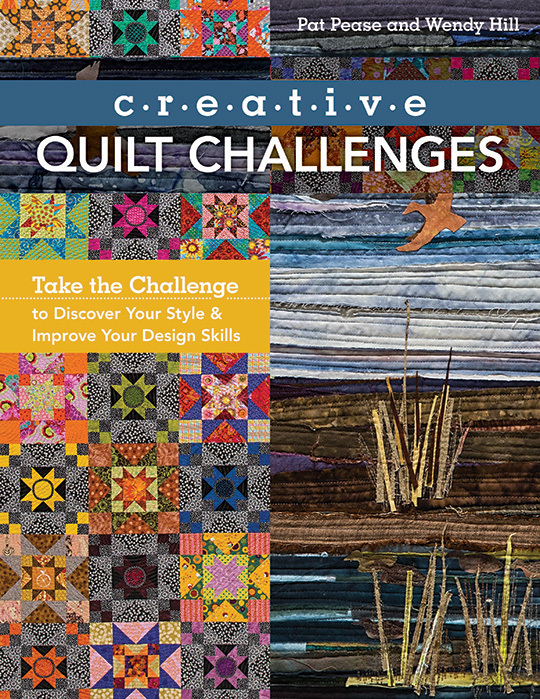 Plus, you can enter to win a free copy of Creative Quilt Challenges right here: a Rafflecopter giveaway! The giveaway for this stop on the blog tour ends 4/4, and winner will be announced here on the blog. Congratulations to Janie M, winner of this giveaway! And thanks to everyone else who entered as well.